Torys LLP is one of Toronto’s leading law firms. The firm has occupied nine floors in the south tower of the Toronto Dominion Centre since the 1980’s. 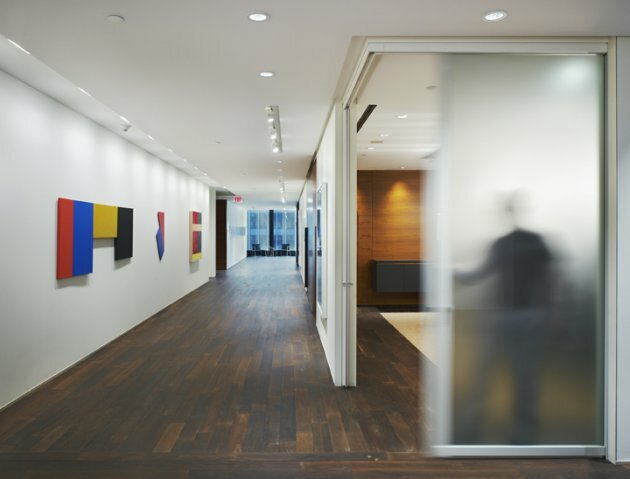 In 2005, Torys recognized its traditional interiors were no longer aligned with the leadership and innovative spirit that is today the hallmark of the practice. The proposed renovations were conceived to bring the existing premises up to current standards of practice from both a functional and aesthetic perspective. 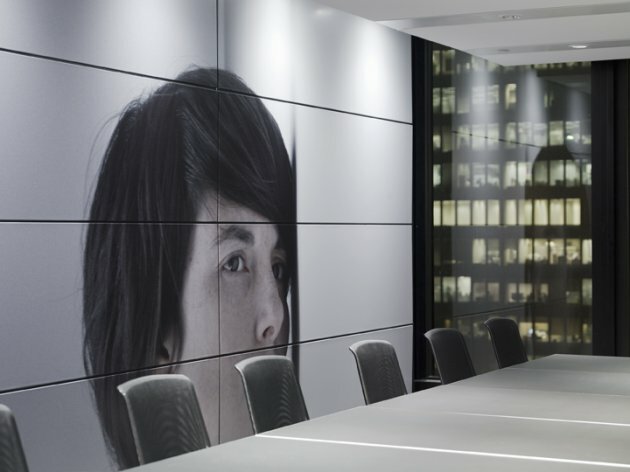 The principal objective was to consolidate client and executive spaces. 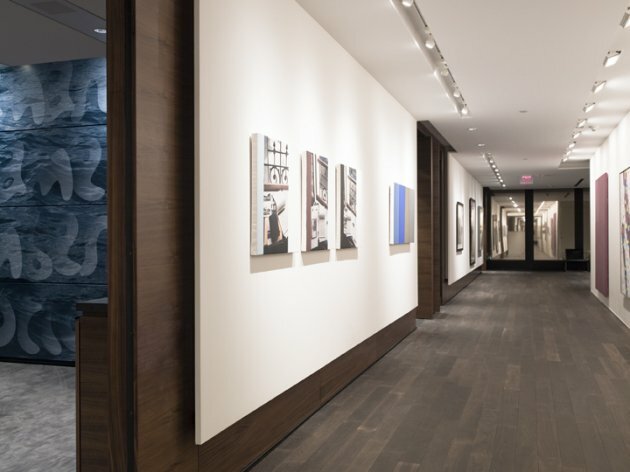 An underlying goal was to foreground Tory’s contemporary Canadian art collection, which is distinguished by photo-based and conceptual works by internationally-lauded artists such as Edward Burtynsky, Rodney Graham, and Yves Gaucher, among others. Visit the website of KPMB Architects – here. The centerpiece of the project is the Client and Executive Floor. 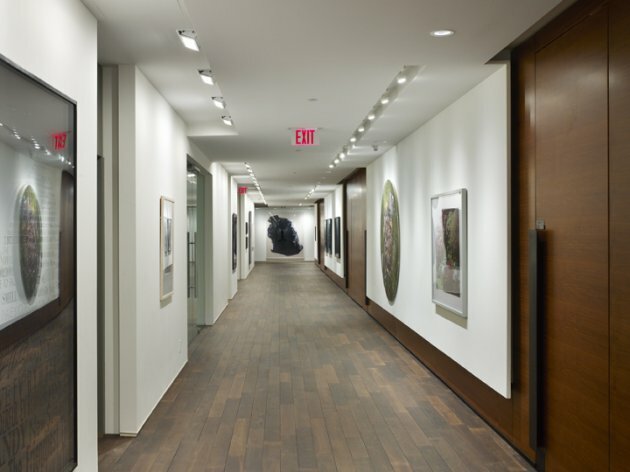 A generous, continuous loop of circulation is organized around the core and is designed to function as a seamless gallery space. Views terminate at all four corners. Connectivity between floors is enhanced with the redesign of the interconnecting stair – a new wood and glass staircase facilitates movement and greater visibility between the 32nd and 33rd floors. 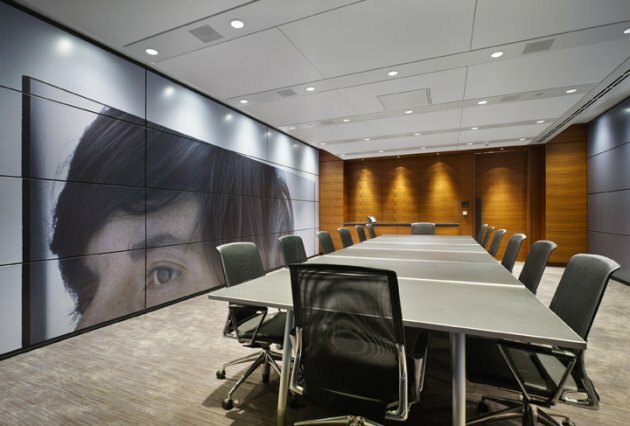 The north and south facing boardrooms occupy one, long extended, column-free space. Each provides flexible convertible space which can respectively be divided into smaller meeting spaces or completely opened up with a system of skyfold walls. 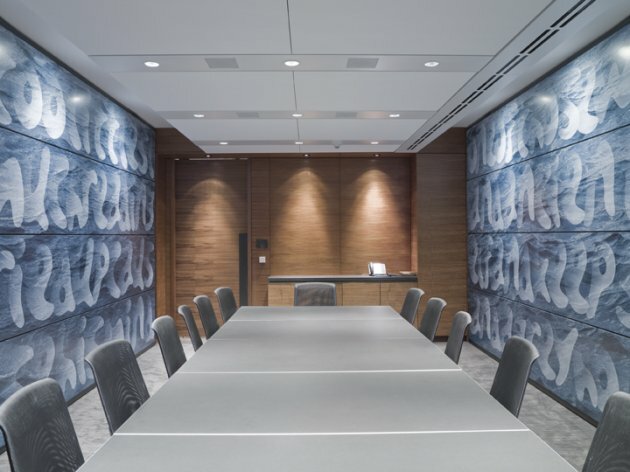 The skyfold wall system manifests Torys’ commitment to innovation and to contemporary Canadian art. The patented system was customized with integrated art works by Montreal artist Pascal Grandmaison and Toronto-based artist Robert Fones. Both artists were selected through an invited design competition organized by the law firm, the architects and art consultant Fela Grunwald. 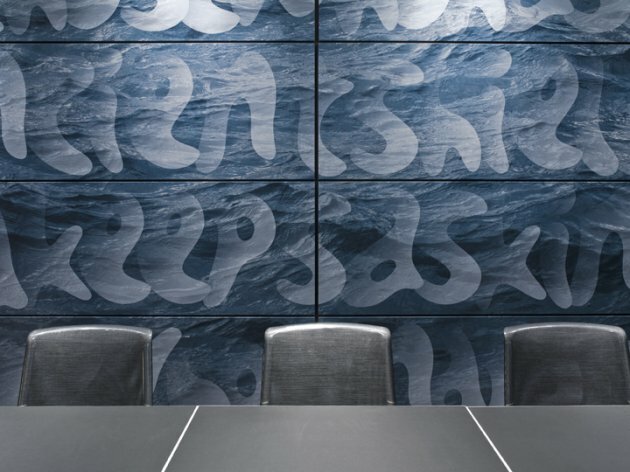 The south-facing boardrooms feature Robert Fone’s Somewhere… which weaves six short fragments from Miguel de Cervante’s Don Quixote with photographs of waves of the Toronto Harbour into the individual panels. The artist describes the skyfold panels “as pages from a giant book, with its spine in Lake Ontario and its pages open to the city. 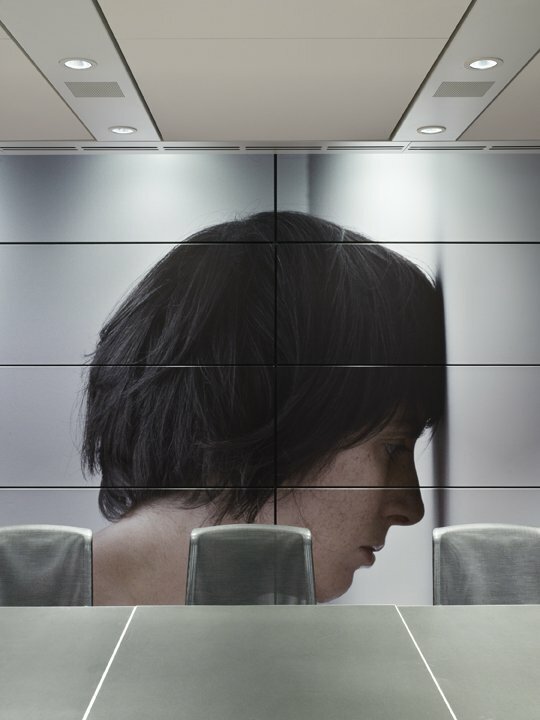 North-facing boardrooms feature Pascal Grandmaison’s With The Light (On My View) / False Reflection Become On Me. 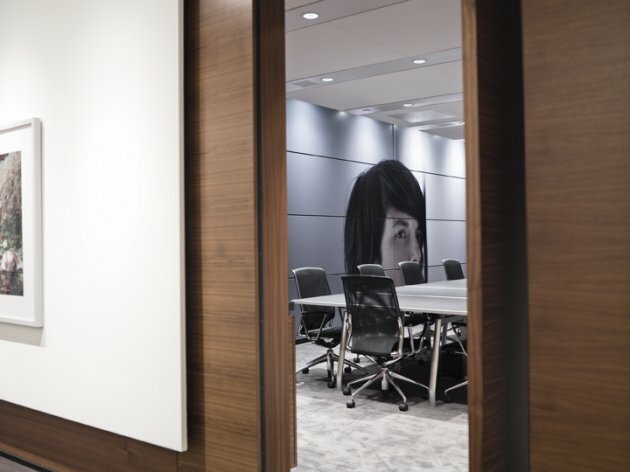 Grandmaison’s concept plays on the fact that the principal function of meeting rooms are to make decisions. The walls feature various views of a colossal head in profile, pensive in expression and ambiguous in gender. Grandmaison explains that the sequence of images articulate “through metaphor the path (from broad to specific) of the decision-making process; how our inner powers of concentration can become an idea that can be communicated to others.” At the same time the portrait’s gaze forces our view onto the Cartesian grid of Mies’ original north towers. A priority in the redesign was to highlight the character of the original Mies van der Rohe office tower. The strong dark mullions of the original tower are both contrasted against lighter travertine panels, and counterbalanced with a complementary palette of fumed oak, walnut, marble and bronze. Ultimately, the design underscores the creativity of critical thinking that is at the essence of the practice of law.